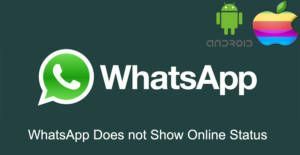 WhatsApp does not allow anyone to hide themselves and online status cannot be hidden by other people on Android and iPhone. However if you are new on the WhatsApp Messenger, may be you mean last seen feature and if you try to check online status of your friend, you won’t able to see last online time. This is completely different issue. You do not see last seen status because he has changed the privacy settings of the application. WhatsApp does not show online status of the individuals because of only one reason. We are going to tell you these on here. Actually there are some unofficial APK’s which are showing online status of people but we never recommend you to use apps which are not accepted by Google Play. If you cannot see online status of someone at all and if you cannot see last seen time, it means he/she has blocked you. However you will need to ensure that. We recommend you to check our article “How to Understand If Someone Blocked You on WhatsApp” to figure out if you get blocked or not. If you cannot see online status of someone for a long time, there won’t be any reason of that. Unfortunately WhatsApp doesn’t allow their users to go invisible at the moment.